Please note that because the effects of these filters are cumulative (readings at other outlets will decrease after you plug in one filter), using the meter by itself, without any filters with which to help test it, will not give you the most accurate readings. We recommend starting with at least five filters when you buy a meter to test your home. Click here for a book on radio frequencies. Click for a video on how the Stetzer system differs from other brands. Click here for a PowerPoint presentation given by Cutting Edge President Jules Klapper at the 2011 Weston A. Price conference. These filters have saved my life! Highly recommend! I moved into an apartment and soon knew that something was very wrong in this apartment. I felt bad as soon as I walked in the door every day. I soon began to feel very dizzy with waves moving through my head and then started have rapid heartbeat so I became afraid to sleep - as felt I might die of a heart attack in my sleep. I suspected EMFs (electromagnetic frequencies both high (wireless--which I felt might be causing the dizziness) and low (as the electric ceiling heater bothered me intensely). I did a lot of research and heard about these filters on a Youtube video with Magda Havas, in which she spoke about the amazing results these filters were having in Canada schools an in people's homes. Someone also told me about Cutting Edge, so I went there in person and was able to buy the Stetzer meter and a box of the filters, all at lower prices than sold online at other stores. They also told me that I could have a full refund if I returned them within a month and they did not help. They are really easy to install. The instructions are very clear. You just take a measurement at your highest use area, and then install a filter. I had to use all 10 filters for a small 1 bedroom apartment, but found out I had "industrial" readings in my apartment of up to 1000 units (on the Stetzer meter) in some areas, and over 700 in my bedroom. But I had huge and immediate relief in my apartment. The rapid heartbeat was gone!!!!! And I was able to sleep again. If I take a filter out in one of the worst areas, it feels bad again immediately. I also sent an email to Dave Stetzer, the electrical genius who created these filters with a few questions. To my surprise he called me back the next morning and answered all my questions with many helpful suggestions. He took over an hour of his time to share information with me. One of the things he told me was that if you have a Stetzer meter reading of 1000, then you have a 30-35% chance of getting cancer within one year. He suggested getting a RF (high frequency) meter for measuring wireless EMF like cell phones, Wifi, ipads, microwaves, cell towers, etc., and other radiation coming through space that is not coming through the electrical wiring. 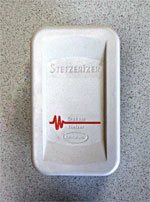 (the Stetzer filters are plugged right into your outlets and filter out the electrical surges and other dirty electricity caused by transients, transformers, etc. This is all explained in the book "Dirty Electricity" by Donna Fisher (and will do a review of that book also as highly recommended). However I am still dizzy when in my apartment, so I am paying to get out of my lease early, and am moving to a mobile home in the woods very soon, if all goes well. But I will take the Stetzer meter and filters with me and keep them for the rest of my life. I think they will be useful wherever I am living. We are probably all exposed to some dirty electricity these days - especially as most circuits are so overloaded, that there is no way the dirty electricity can go back on the neutral wires as it was originally designed to do. Thus it is going into our homes and into the earth and our bodies, etc. Thank you to Dave Stetzer and Mr Graham for these wonderful filters! And thank you to Jules and Regina for having them in their store available to test out and see and if they make a difference for you, too. These filters work! I was able to bring the "dirty electricity" in my home down to a safe level by using the Stetzerizer Meter to measure before and after plugging in the filters. I have a 1400 square foot home and all of the outlets tested high initially - especially around the computer and the flat screen TV. After placing 14 filters in the outlets and surge protectors that had the highest radiation, the levels came down to an acceptable level, even in outlets that didn't contain a filter.